This report shows Profit and Loss (P&L) by individual order based on transactions made on a specific date, or range of dates. From here, click each order to open it. To access this report, click Reports > Transaction Reports > Profit by Order Details. For the report summarizing these orders by channel, company, manufacturer, product type, or product vendor, see Profit by Order Summary. To see profit and loss based on Ship Date, run the P&L Reports. After clicking Run Report, you can see each specific filter you applied (if a filter is not shown, you left it blank or chose All). Here's a common report filter. Include only the orders from one or more companies, or include orders from all companies. Include orders from only one group of companies, or include orders from all companies. *Only shown if you enabled the company group setting and grouped companies together. Learn how. Include only the orders from one or more sales channels, or include orders from all channels. Custom (default)- Enter the Start and End Dates. For a single date, choose the same Start and End Date. Date ranges (presets) - There are 22 choices from Yesterday to the Last Year to Date. ​Include only the orders belonging to one wholesale customer, or include all orders. Include only the orders belonging to one sales representative, or include all orders. Include only the products belonging to one or more purchasers, or include all products. Include only the products belonging to one product type, or include all products. Include only the products belonging to one product group, or include all products. Include only the products belonging to one vendor, or include all products. Note: For dropship orders, this will be the vendor that the products were actually purchased from. Include only the products belonging to one manufacturer, or include all products. Include only the products belonging to one brand, or include all products. Include orders with specific settlement IDs. A settlement is a channel's order-related fees, commissions, and taxes. Currently, this filter works for Amazon/FBA, eBay, and Newegg settlements. For one Settlement ID - Enter a specific Settlement ID and click Run Report. Include orders by order number. 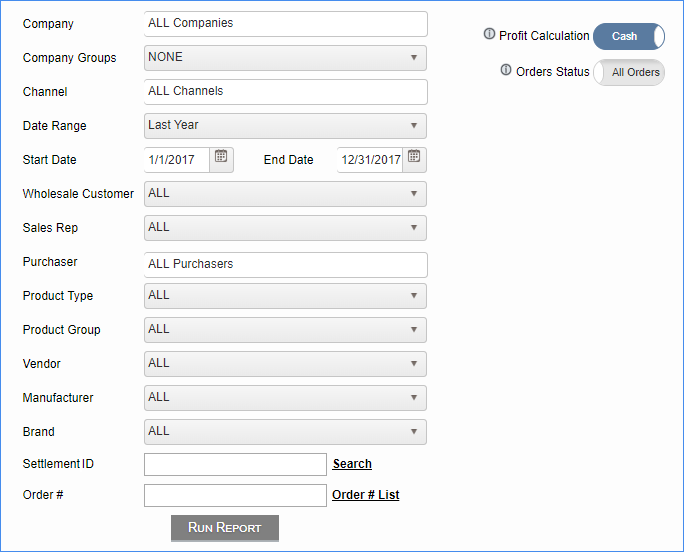 For one order number - Enter a specific order number and click Run Report. For multiple order numbers - Click the Order # List, then enter or copy/paste multiple order numbers on separate lines, then click Select Orders to populate the Order# box, and then click Run Report. For all order numbers in your date range - Leave this field blank and click Run Report. Cash - Shows profit based on Payment of the orders. Accrual - Shows profit based on Grand Total amount of the orders. Note: If you choose Cash Profit, you can still see each order's Accrual Profit by opening the order and hovering over Cash Profit on the P&L tab, and vice versa. All Orders - Show profit for all orders regardless of settlement status. Settled - Show profit only for orders that have settlement data. You can export this report to a spreadsheet with additional data by clicking the Export to Excel icon. For spreadsheet details, see About the spreadsheet data. 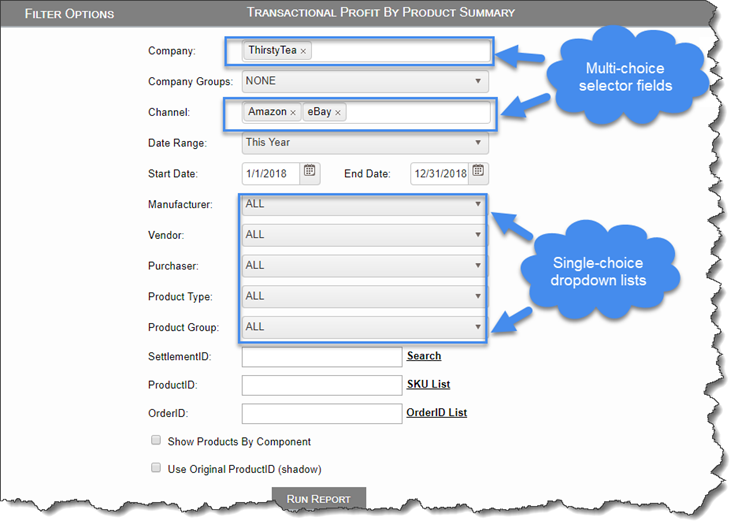 The unique order identification number in SellerCloud. Click the # to open the order, see its details, and choose an action. The unique order number from the channel. Total quantity of items sold. Total amount of the items before shipping, discounts, tax, etc. ​Amount the buyer paid for shipping on the order. ​Amount the buyer paid for tax on the order. Refunds on tax are also included. Total of handling, gift wrap, insurance, discount, and shipping discount. Grand Total calculation: (Subtotal + Shipping Total + Handling + Insurance + Gift Wrap + Tax) - (Discount + Shipping Discount). *Only shown if you set the filter's Profit Calculation toggle to Accrual. Actual amount the buyer paid (usually the same amount as Grand Total unless there was an underpayment or overpayment). *Only shown if you set the filter's Profit Calculation toggle to Cash. Total refund amount from orders. Adjustment amounts, either positive or negative, to orders. Cost of the items on the order. Includes refunded costs. In reports, Items Cost is based on A) The item cost on the Order Date, and B) The method used to calculate cost, which is determined by the Client Setting Order Profit & Loss Calculated Using (either Average Cost, Site Cost, or Last Cost). Here's how P&L is calculated and tracked on an order. Watch how SellerCloud calculates item cost. The cost for outbound shipping. Includes refunds on shipping cost. For FBA - This includes the following types of fees: FBA Per Unit Fulfillment Fee, FBA Weight Based Fee, FBA Per Order Fulfillment Fee, Shipping Chargeback, Gift Wrap Chargeback, and Cross-Border Fulfillment Fee. Channel selling fees. Includes refunds on commission fees. Total of shipping cost, commission (channel selling fee), transaction fees (Paypal processing fee), posting fees (eBay listing fee and Reverb bump fee, dropship fees, co-op fees, and tax payable. Cash Profit or Accrual Profit, based on the filter's Profit Calculation toggle (Cash or Accrual). Cash Profit Margin or Accrual Profit Margin, based on filter's Profit Calculation toggle (Cash or Accrual). Exported spreadsheets include more data than the grid report. Spreadsheets also let you manipulate data, such as filter within a column, sort with advanced parameters, etc. You can even create custom bar graphs and pie charts; for example, to show daily sales trends for a selected date range. Date the order was shipped. Total amount of the items before any shipping, discounts, tax, etc. Amount the buyer paid for tax on the order. Refunds on tax are also included. Amount the buyer paid for handling on the order. Amount the buyer paid for insurance on the order. Amount the buyer paid for gift wrap on the order. Amount of discount applied to the order. Amount of discount applied to the shipping. ​Total of handling, insurance, gift wrap, discount, and shipping discount. Unlike the grid report, this appears whether the filter's Profit Calculation toggle is set to Cash or Accrual. Unlike the grid report, this appears whether you set the filter's Profit Calculation toggle to Cash or Accrual. Total refunds amount from orders. Adjustments, either positive or negative, to orders. Cost of the items on the order. Items Cost in reports is based on A) The item cost on the Order Date, and B) The method used to calculate cost, which is determined by the Client Setting Order Profit & Loss Calculated Using (either Average Cost, Site Cost, or Last Cost). Includes Refunded costs. Here's how P&L is calculated and tracked on an order. Incentive amount the vendor reimburses for a product's promotion. For FBA - This includes the following fee types: FBA Per Unit Fulfillment Fee, FBA Weight Based Fee, FBA Per Order Fulfillment Fee, Shipping Chargeback, Gift Wrap Chargeback, and Cross-Border Fulfillment Fee. Channel selling fee. Includes refunds on commission fees. eBay listing fee and Reverb bump fee. Allowance fee from select channels. Tax payable portion of the order. Total of shipping cost, commission (channel selling fee), transaction fees (Paypal processing fee), posting fees (eBay listing fee and Reverb bump fee), dropship fees, co-op fees, and tax payable. Calculation: (Item Cost - Rebate) + Shipping Cost + Commission + Transaction Fee + Posting Fee + Dropship Fee + Co-Op Fee + Tax Payable). This is based on the Grand Total amount of an order. Accrual Profit calculation: Sum(Grand Total) - (Item Cost + Total Fees) + Adjustments. This is based on the Payment amount of an order. Cash Profit calculation: (Payment - Refunds) - (Item Cost + Total Fees) + Adjustments. Accrual Profit Margin calculation: (Sum(Grand Total) - (Order Cost Total + Adjustments)) / Sum(Grand Total) * 100. Cash Profit Margin calculation: ((Payments - Refunds) - (Order Cost Total + Adjustments)) / (Payments - Refunds) * 100.